Gorgeous Laura! I love that dress and bag! This is the first summer that I've actually put my 5"2 self in long dresses like this and I'm loving it - aside from my maxi. Combined fall + flash in one movement, in front of gridlock traffic. Gahh. The bag is gorgeous, are some studs blue or is that the light? The bag is great, I wish I found myself doing more diy projects. A lot of bloggers are beginning to inspire me, with bags, necklaces, and ext. Great ideas! I love DIY projects, I got some flatback Swavroski Crystals and superglued them in floral patterns on the back of a boring little mirror that I had. It came out so cute. Good luck with your bag project. Oh and I love the dress, but it looked so long online. Optical illusion? gorgeous! And I really like you bag too! It has the perfect amounts of class and edge. I love the dress! It doesn't seem so awkwardly asymmetrical on you as it did on the model — it looks completely awesome. Fwiw, I like the blueness of the studs. They add a tiny bit of something to the bag. Great outfit!! I especially love those shoes! I'm gonna check out my local Zara for sure! You look great as usual but I am especially love your bracelet - it's to die for! I love your style, Laura, this dress is simple but so beautiful! These shoes are a huge hit over here in Croatia, it seems like everyone has at least a pair. They are very comfortable (every brand I've tried so far)and so comfortable to walk in. Always great to slip a Geordie Shore reference in. how can i've just discovered your new blog? ahh im so late, i've been following you since youtube time. anyways, read all the posts and i think im caught up now. ehehe. 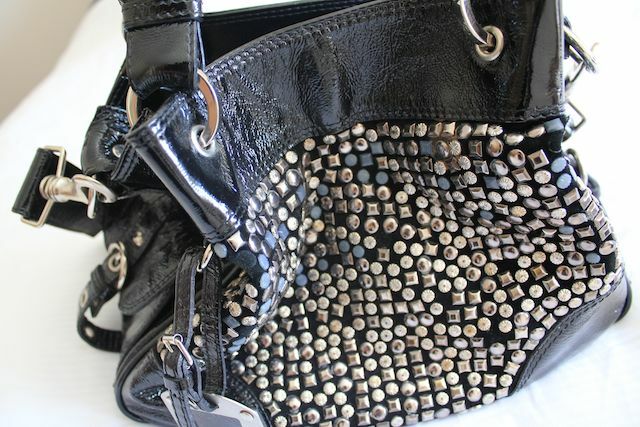 the simple dress and bold over the top studded bag complement each other so well in this outfit. you look fab and im a bit obsessed with the bag! Yes, I´m one of the five people that still checked your old blog. Great bag! And you look gorgeous as ever! Love this outfit, that bag is gorgeous too! Beautiful! So simple, but perfect for the good weather. Good luck with the bag, I'd be terrified to even attempt studs. Love the dress and sandals. I've just bought a T by Alexander Wang skirt and I love the material so much! You look gorgeous and that outfit is really classic looking, I love it :) The bag's amazing too! This dress is gorgeous on you! And I too love saying WANG! I absolutely love everything about this post! Your outfit is beautiful and I can't stop obsessing over your accessories! I scoured the Gucci website for those sunglasses but they just don't fit into my college student budget :( perhaps i'll find some cheap knock offs at forever 21? Fingers crossed! and p.s. those shoes are amazing! Good luck with DIY-ing on the purse! I tried that shoes when I last went in Zara. Shizz! Now that I saw it on you, I feel like getting it. :) It looks so adorable. Love the bag and the outfit! Just found your blog through bloglovin, love it. These necklace are looking so beautiful.